Description: Pholistoma membranaceum is an annual herb with a waxy, fleshy, bristly stem and branching profusely, sometimes forming a tangle. The inflorescence bears 2 to 10 flowers each under a centimeter wide. 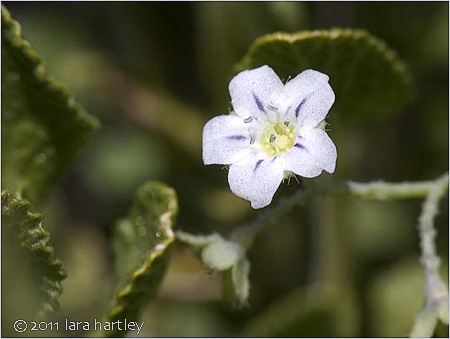 The flower is white, usually with a purple spot or streak on each of its five lobes. Leaf: The leaves are deeply lobed or cut and borne on winged stalks. The foliage is coated in hairs. Notes: Pholistoma membranaceum is a dicot that is native to California and is also found outside of California, but is confined to western North America. Distribution outside California: Baja California. This photo was taken on April 6, 2005 in the Providence Mountains, Mojave National Preserve, San Bernardino County, California.